Strainers for restaurant kitchens. These restaurant Strainers are strong and durable for busy kitchens. Choose from mesh strainers, china cap strainers and others from Update International and Vollrath. Vollrath Wear-Ever Spaghetti Aluminum Stainer - 5 Qt. Tablecraft Fine Bouillon Strainer - 9.25 in. Tablecraft Coarse Mesh China Cap Strainer - 10 in. Tablecraft Fine Mesh Strainer - 10.25 in. Tablecraft Medium Mesh Strainer - 10.25 in. Tablecraft Heavy Duty Mesh Strainer - 11.75 in. Tablecraft China Cap Fine Mesh Strainer - 10 in. Tablecraft Fine Mesh Strainer - 6.25 in. Tablecraft Medium Mesh Strainer - 6.25 in. Tablecraft Double Medium Mesh Strainer - 8 in. Tablecraft Double Fine Mesh Strainer - 8 in. Update International Chromed Steel Aluminum Pan Strainer - 10 in. 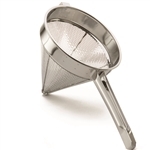 Update International Stainless Steel Funnels With Removable Strainer - 5.75 in. 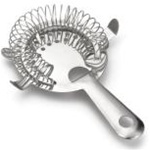 Update International Fine Reinforced Double Mesh Round Wooden Handle Strainers - 11.75 in. Buy your restaurant Strainers from the leader in restaurant supply.